In order to understand how foam suppresses fire, it is first necessary to understand the process of combustion. Combustion is a process where fuel undergoes a rapid exothermic chemical reaction (release of heat) with an oxidizing agent, usually air, resulting in the formation of products of combustion and energy (fire). A fuel is any material that can be oxidized; it can be a solid, liquid, or gas and is generally organic in nature, i.e., composed mostly of carbon, hydrogen, or oxygen. The products of combustion of an organic fuel (assuming complete combustion) are carbon dioxide and water. The energy released may be in the form of heat or light, or the combination of heat and light (fire). Remove heat at a faster rate than it is released. 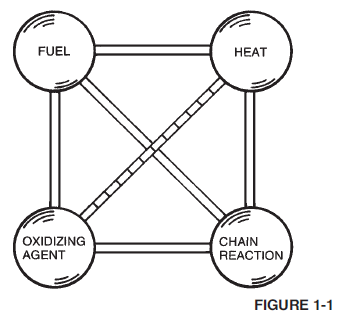 Separate the fuel from the oxidizing agent. Dilute the vapour-phase concentration of the fuel and/or oxidizing agent below that necessary for combustion. Terminate the chemical chain-reaction sequence. 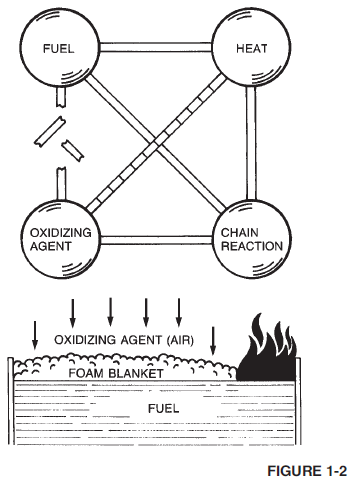 Fire fighting foam is an aggregate of gas-filled bubbles (Figure 1-2) formed from aqueous solutions of specially formulated, liquid agent concentrates. The gas used is usually air, but certain applications use an inert gas. Since foam is lighter than flammable and combustible liquids, it floats on the fuel surface producing a continuous blanket that suppresses fire by separating flammable vapours and oxygen as shown in Figure 1-2. Because foam is a water-bearing material, it also cools the fuel surface.